Traveling the Bayfront Parkway from the west is a fairly hopeful journey. On the north side of the parkway, drivers see luxury housing, marinas, and, of course, access to the water, both public and private. Erie's waterfront is consistently noted as the region's most cherished asset. Gov.-elect Tom Wolf recently told the Erie Reader that "Erie is the Riviera of Pennsylvania" and that it's one of the "greatest freshwater ports in the world." But in order to take full advantage of that identity, Erie needs to invest in both its transportation infrastructure for land and lake – and the waterfront generally. 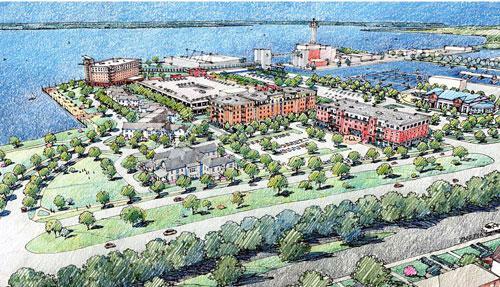 To that end, there will be great change to Erie's bayfront in the next twelve to eighteen months, as public and private commercial development begin to take shape along the region's most prized parcel of land. Our future, many believe, is incumbent upon the development of something notable, and notably sustainable, at the water's edge. The previous two years have been marked by the "Hotel Wars" being fought upon the properties surrounding the Erie County Convention Center. It's all been a bit Hatfield and McCoy's, but here are the CliffsNotes to get us into 2015. 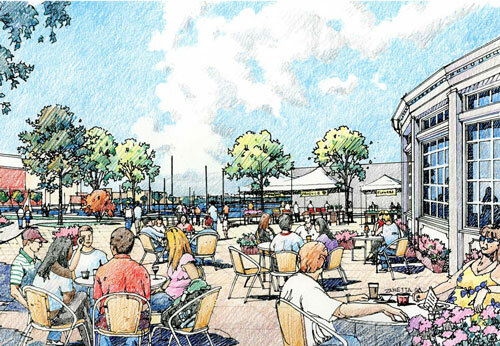 In late 2013, Scott Enterprises, which developed much of upper Peach Street, announced plans for the $150 million mixed-use Harbor Place development adjacent to the Erie Maritime Museum. Scott Enterprises has owned the property since 1999. 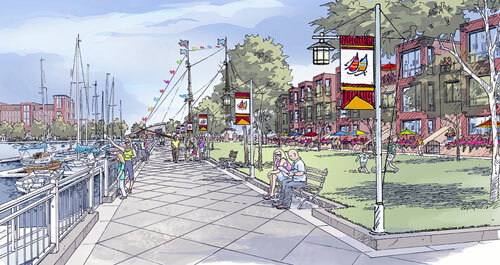 By all accounts, Harbor Place was a solid proposal, bringing together private offices, hotels, parking, and public pedestrian bridges to the top of the bluff, as well as walkways, skating rinks, and – wait for it – a much vaunted floating entertainment barge. It was as much for Erie as it was for travelers and conventioneers making their way through the Gem City. This was the Scott's second serious attempt to open a hotel along the bayfront. The first, an agreement between Scott Enterprises and the Erie County Convention Center Authority (ECCCA) for Scott Enterprises to build the Convention Center hotel, which is now the Sheraton Bayfront Hotel, fell apart in 2003 leading to lawsuits and a lingering foul taste in the mouths of both parties. They returned to the bayfront in 2013 with Harbor Place. With a grand announcement, the Scotts' Harbor Place seemed difficult to challenge. It brought to life much of the bayfront promise that has gone unrealized for decades. That is, of course, until the ECCCA announced its plans for a second hotel associated with the Convention Center – the 191 room Courtyard Erie Bayfront Hotel and a new parking garage – on the site of the former GAF property. That ground has been broken and doors are expected to open in the spring of 2016. The new hotels would not be competing, insists ECCCA executive director Casey Wells. They'd be complementary. Nick Scott, Sr., president of Scott Enterprises, has publicly called the development "irresponsible." Such rhetoric was part of a campaign to convince Erie County Council to reject a county guarantee of up to $30 million in long-term financing, which would be used in conjunction with a $25 million state grant, for the Courtyard Erie Bayfront Hotel construction just as it had done for the construction of the Sheraton Bayfront Hotel in 2005. The deal wouldn't mean that Erie County taxpayers would pay for the additional hotel, unless, of course, the ECCCA defaulted on its loans. In that case, the county – and thus county taxpayers – would be responsible for payment in full. Think of it like a parent co-signing for their kid's car. But in this analogy mom and dad are on the hook for $30 million instead of a couple thousand bucks. As an insurance policy on the ECCCA's commitment to the project, freshman County Councilman Jay Breneman brokered a deal in which the ECCCA would pay the county $65,000 per year to supplant the tax revenue lost to the hotel's tax-exempt status. The Convention Center Authority agreed to the deal and County Council agreed to guarantee the loan, saving the ECCCA millions of dollars in interest thereby ensuring that Erie kept its $25 million grant from the state. The machinations behind these deals are complicated. The Scotts met on several occasions with members of County Council in support of private development. The ECCCA did the same on behalf of public development. At the end of the day, County Council helped leverage the public deal. Remember, though, that this is not the first time that Scott Enterprises dipped its toes in the water of Presque Isle Bay. A private development was announced in the late 1990s when it looked like the Commonwealth was going to sanction riverboat gambling. But gambling didn't come to the water – and neither did Scott Enterprises. Instead, it held on to the land for future use that by all accounts always included at the very least a hotel, and at best, something akin to Harbor Place. In 2001, Nick Scott, Sr. entered into an initial agreement with the ECCCA to build a hotel and restaurant in conjunction with the construction of the Convention Center. At that time, it was planned to be built on the east bayfront at the same location where Harbor Place is now being proposed. Scott said that he was waiting for then-Gov. Tom Ridge to announce how much the state would contribute to the Convention Center construction. Ridge said simply, "it was not a matter of if, but when." Scott and the ECCCA ultimately failed to come to terms on the project. The authority ended its relationship with Scott and the ECCCA moved the Convention Center – and the Sheraton Bayfront Hotel – to West Dobbins Landing. Scott Enterprises later paid the ECCCA $1.3 million following a legal settlement in which an Erie judge initially found Nick Scott, Sr., liable for the Convention Center Authority's losses on the botched original deal. In 2003, the Erie-Western Pennsylvania Port Authority committed to bringing a mixed-use development to East Dobbins Landing. Then-mayor Rick Filippi told the Erie Times-News, "I've always seen our bayfront as a mixed-use development with plenty of retail, entertainment, commercial, and residential opportunities. I see it as a self-sustained destination point, and I think we'll get there in the next ten years." Yet here we are, twelve years later, with no development on the east bayfront and a great Scott plan that feels more and more contingent on state funding before it moves forward. And while you're contemplating the lay of the land, don't forget about local developer Tom Kennedy's 54 room Bayfront Cobblestone Inn & Suites, which was announced mid-2014 and is expected to open this year. The timeline for Harbor Place is, shall we say, fluid. The Scotts hoped to capitalize on City Revitalization and Improvement Zones, or CRIZ, money, which was a competitive grant from the state that ultimately was awarded to Lancaster and Bethlehem for the current funding cycle. CRIZ funds allow regional tax dollars to be reinvested in the designated zone rather than going into the general fund in Harrisburg. Erie's CRIZ application was denied because the city listed the Sewer Authority as the administrative agency, but the state said the Sewer Authority didn't qualify to administer the $12 million grant, which would have helped fund walkways and other public infrastructure related to the Harbor Place development if the bayfront was designated a CRIZ. CRIZ applications will reopen in 2016, when the city plans to reapply. That is, unless Gov.-elect Tom Wolf pushes for changes to the CRIZ legislation. Both the Port Authority and Scott Enterprises are hopeful that a new governor means new CRIZ-related opportunities. Port Authority Executive Director Brenda Sandberg, who coordinated the city's first application when she was director of the city's economic development office, and Scott Enterprises Vice President Nick Scott, Jr. say the prospect of Erie's success in the next round of CRIZ funding is positive. A CRIZ designation for the bayfront would rapidly accelerate the Harbor Place project. However, the Scotts would still have to foot the bill for the private development, including hotels, office, and retail space. And this is essentially the state of the Hotel Wars as of Dec. 31, 2014. Despite the forward momentum along Erie's bayfront, it remains largely undeveloped. The Port Authority is the overseer of the bayfront master plan. In that capacity, it monitors both public and private development on land and in the water. It has participated in the construction of the Blasco Library and Erie Maritime Museum, marinas, and campgrounds. But perhaps the most notable illustration of its commitment to commercial infrastructure on the bayfront was the orchestration of the proposed relocation of GAF Manufacturing Corporation to facilitate the future development of projects related to the Convention Center. GAF closed rather than relocate, but the outcome was the same. A prime parcel of bayfront property was cleared for commercial development. As economic development initiatives trend toward retail, office, and hotel space along the immediate east and west of State Street, Sandberg says that much of the Port's future has to do with shipping and transport. "It's making the Port of Erie a little more well-known throughout the Great Lakes for what our capacities are," says Sandberg. But providing access to the port also means monitoring the flow of traffic and the future of the Bayfront Parkway. PennDOT recently began a review of the Parkway, its capacities and its future. The next iteration of the stretch of road that runs from West Eighth Street on the West Side to the Bayfront Connector on Erie's East Side will be an important part of planning a successful region. For example, the footpath that will bring pedestrians from the top of the bluff near Cranberry Street to a crosswalk at Liberty Amphitheater will mean that the flow of traffic will be interrupted by a traffic light whenever the public makes its way to the water. That path and that light will meet at the foot of Tom Kennedy's Bayfront Cobblestone Inn & Suites. PennDOT is seeking public comment on the future of the Bayfront Parkway, but between the development of two new properties already underway and the potential for major development at Harbor Place, it seems that the future of the roadway is preordained. "My guess is that the Bayfront Parkway will need to be seen as a commercial street rather than an access highway," says Sandberg. "Improvements will have to be made and the question is what kind of improvements will be appropriate." Improvements to transportation along Erie's bayfront seems to be the critical piece to the hotel and convention puzzle. Traffic lights at the Erie Water Works, at the Bayfront Convention Center, and at the intersections of State and Holland streets with the Bayfront Connector each interrupt the flow of traffic either for location access or pedestrian crossing. PennDOT's planned evaluation of the roadway in 2015 will have to account for the new commercial space, in addition to industrial expansion and public transportation that will connect downtown with the bayfront. Once people are in Erie, for conventions or vacation, they need to remain mobile. If people only make it to the bayfront, but never see the downtown, the region still loses. If the area surrounding the Convention Center remains an island, closed off from the other great amenities throughout the city, public support for, and public interest in, the region's most prized asset may wane. Some conventioneers will take the hotel shuttle busses or ride EMTA's cultural loop, but others will require more personal service. And if a first-time visitor leaves the hotel without their crib sheet on the rules of engagement with Erie's Yellow Cab, they're likely to leave Erie with other destinations in mind. Walkability of the bayfront and linking the downtown to bayfront development is a major issue facing all developers on our waterfront, public and private. "All of the parties involved need to explore how we improve that connectivity," says Wells. "It's beautifully walkable in July, but not in January, and we need to make that a reality as we reach a critical mass on the bayfront." It's the kind of chicken and egg proposition that developers and politicians alike would rather avoid. But doing nothing is no longer an option. Indecision returns Erie to 2003, looking forward to what the property could be in another ten years. "The largest complaint about bringing conventions here is hotel sprawl," says Wells. "There are plenty of rooms in the marketplace, but nobody wants to spend 20 minutes on a trolley or a bus going to and from the Convention Center to go to hotel rooms." Wells's statement sums up why the ECCCA – as well as Tom Kennedy and Scott Enterprises – believes it needs, and can support, multiple hotel development along Erie's bayfront. Convention planners are looking for increasingly greater numbers of hotel rooms in close proximity to the convention site. "There were eight of those negotiations in 2014 and we're close to bringing those events here when we have the hotel rooms," Wells says. Tom Kennedy agrees. In stark contrast to the Scotts' rollout of Harbor Place, Kennedy has quietly navigated the development process in order to prepare to break ground on his modest-by-comparison hotel. "It takes some time to get your presentation together and you can't fight the process," Kennedy says. "I like to hear people say, 'Wow! That happened quick,' and be pleasantly surprised rather than go out there and tout it up and have nothing happen." His market research has also indicated that the area between the Convention Center and the interstate could support another hotel and that the Bayfront Cobblestone Inn & Suites, when grouped with the Sheraton and ECCCA's Courtyard Erie Bayfront Hotel, will give the ECCCA enough hotel space to attract the larger conventions it's sought to bring to Erie. "You've got to look at the market rates for these types of things," says Kennedy. "We had a feasibility study done and we're a little bit different of a hotel. But when you look at what the Sheraton is getting from a room rate standpoint and what they're planning for the Courtyard and [Harbor Place], I think we're going to hit an interesting market." Kennedy's hotel is different because its rooms generally have a price point below one-hundred dollars. He expects this to attract fishermen, boaters, and conventioneers who may not want to pay the standard rates of the Sheraton Bayfront Hotel and the Courtyard Erie Bayfront Hotel, which will provide direct access to the convention site. This market-based approach is also leading Scott Enterprises to consider extended-stay suites in its Harbor Place hotels. Kennedy has owned the property on the south side of the Bayfront Highway, across from the Sloppy Duck Saloon and Liberty Amphitheater, for approximately ten years. In that time, he explored building townhouses and offices on his parcel of land, but instead found the market ripe for hotel development. 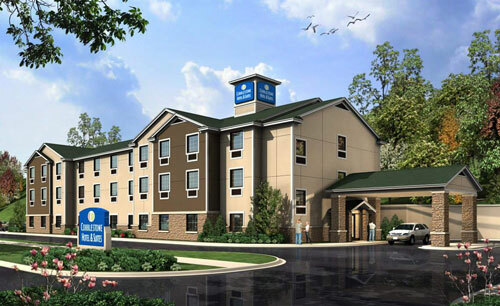 The Bayfront Cobblestone Inn & Suites will be the second of five planned Cobblestone hotels in the region. The first opened in Corry in 2014 and a third will follow near Penn State University, The Behrend College in 2015. But many questions still remain about the Harbor Place development. After a rather audacious start in November 2013, the CRIZ rejection seemed to quiet the Scotts' campaign to rally community support behind their project. "That hurt us," says Nick Scott Jr., vice president of Scott Enterprises. "If we start construction on the hotel or any other phase of the project, then that part of the project does not qualify for the CRIZ. But we are continuing on with our development plans." And those plans are expensive. That makes the CRIZ designation more important because it offsets the cost of building the public spaces – for which there is little or no return on investment – into a private development. The developed property is taxable and the taxes collected return to the site to offset some of the cost of development. The developer still foots the bill. "In order to develop public places," says Sandberg, "that's a cost you wouldn't have on Upper Peach Street or Harborcreek or Fairview or anywhere else. They're not asking for assistance with typical development, but when you're talking about turning areas into plazas and water fountains and ice skating rinks, that's where the return on your investment can't support those public amenities." The Scotts' plans also include discussions with Hilton about which of its hotels is most appropriate for this location and the possibility of putting two different Hilton hotels under one roof. This is a stage that Scott Enterprises hadn't reached in 2001 and was something of a point of contention in the agreement with the ECCCA because it led the Authority to question the commitment of Scott Enterprises to the Convention Center project. "We continue to move forward down there. I don't see it slowing down for any reason," Scott, Jr. says. "It's just that these things take time, and we want to do it right the first time." If there is reason to be optimistic, it's that 2015 will bring the type of development to the bayfront that has been a part of the regional vision for decades. For the first time in a long time, there is also new private development in the works along the bayfront, sparked in part by the public sector's lead in the cleanup and redevelopment of the GAF property. But the long-term goals of the Port Authority, the ECCCA, and entrepreneurs trend toward a continued expansion of private development once developers, like Kennedy and the Scotts, demonstrate the private capital potential for this dynamic corridor, where parallel efforts between public and private entities bridge the divide between developable space and true economic development. "We don't see ourselves, at the end of the day, owning the majority of the bayfront property," Wells says. "We're ultimately going to turn that over to the private sector because that's where the tax dollars will be generated. It's going to be a mixed-use facility because that's what will work." Photos from top to bottom: Environmental Planning & Design of former GAF site, Weber Murphy Fox rendering of Harbor Place promenade, Environmental Planning & Design rendering of potential public space on the former GAF site, a Cobblestone Inn & Suites similar to what Tom Kennedy is erecting on the bayfront.